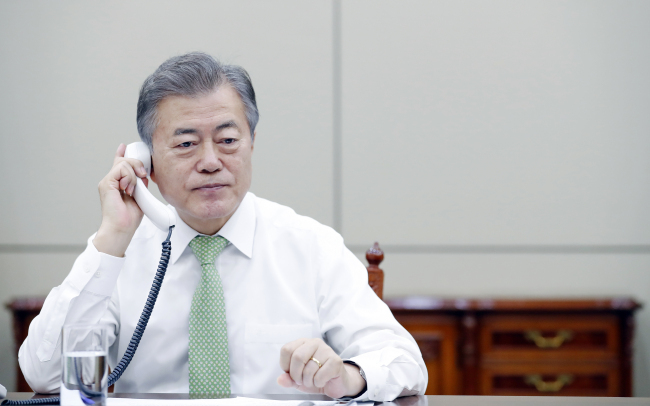 A year into his five-year term, President Moon Jae-in is finding public support for his economic policies far lower than his high approval ratings. A survey of 1,002 Korean adults conducted by Gallup Korea earlier this month showed 83 percent gave a positive appraisal of his overall job performance. But only 47 percent said he was doing well in the economic area, down from 52 percent six months after his inauguration on May 10 last year. What should be taken more seriously by Moon and his economic aides, who have pushed for what they describe as income-led growth, is the outcome of a separate poll that showed more people suffering from declining incomes. 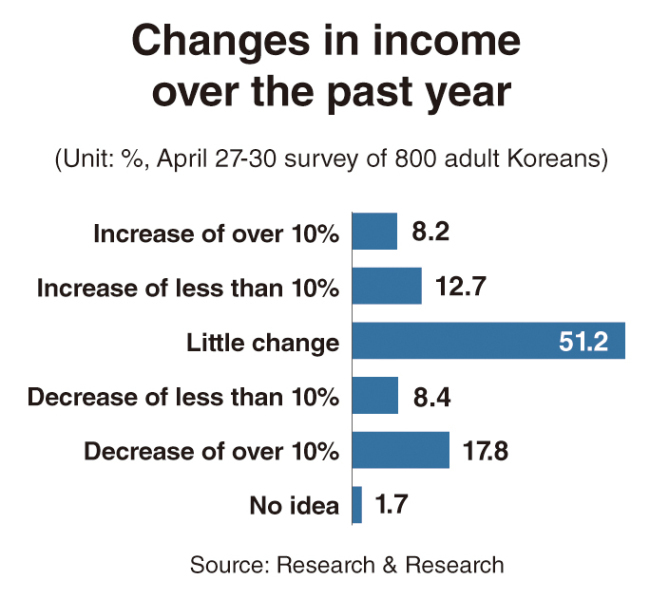 In the survey of 800 Koreans aged 19 or above, conducted by a local research institute last month, 26.2 percent said their incomes decreased in the past year, compared with 20.9 percent whose earnings increased. For the rest, income remained little changed. Self-employed people were hit hardest by income decreases, with more than half of them earning less compared with a year earlier. While slightly more than 20 percent saw a rise in income, more than 40 percent had increased spending over the previous year as prices closely connected with everyday life continued to climb. The survey showed 28.8 percent felt their livelihoods deteriorating over the past year, while only 18.9 percent saw an improvement. The results of the survey are in contrast to the aims of the Moon administration, which has implemented a package of measures to boost household earnings in the hope that increased income would bolster economic growth by encouraging private consumption. It has also sought to expand fiscal expenditure to help create jobs and raise wages. And low-income and self-employed people, who are supposed to be the main beneficiaries of the income-led growth policy, are more likely to report a fall in living standards. In the April survey, 52.8 percent of people earning less than 3 million won ($2,785) per month said economic conditions deteriorated over the past year, with the negative view held by far less than half of those gaining more income. Nearly 65 percent of self-employed people described the business sentiment as worse than a year earlier. This year’s sharp rise in the minimum wage was perceived by people as having a negative rather than positive impact on their livelihoods. Low-income households were particularly skeptical about the effect of the minimum wage hike, with 32.5 percent affected negatively compared to 10.2 percent who saw a positive effect. Despite Moon’s pledge to put top priority on job creation, the country’s unemployment has continued to worsen. According to government data, the unemployment rate rose from 3.6 percent in May last year to 4.5 percent in March, with the figure for people aged 15-29 jumping from 9.3 percent to 11.6 percent over the cited period. He noted its concrete measures aimed at bolstering employment had not been supplemented by effective policy efforts toward boosting industrial activity. Many economists say pro-labor steps taken by the Moon government, including the steep minimum wage hike and the reduction of work hours, have only served to worsen the weak job market. They advise it to put more emphasis on expanding future growth engines for the economy. “Without economic growth, no other policies could be expected to bring the intended results,” said Sung Tae-yoon, a professor of economics at Yonsei University. The Moon administration’s income-led growth policy is closer to a scheme for promoting income redistribution, critics say. It has vowed to push for innovation-driven growth in tandem with income-led growth. But the concept of innovation-driven growth, which is supposed to be pushed for mainly by small and venture companies rather than large corporations, remains vague in terms of how it will help Korea’s economy make another leap forward. In a recent survey of 51 local economists, 62.8 percent said economic policies pursued by the Moon administration have made little contribution to boosting growth. Its efforts toward enhancing fair trade and improving the transparency of corporate governance deserve some credit, economists say, but they add that caution needs to be taken not to undermine the market economy system. They suggest Moon and his economic aides should go in step with the global trend of promoting growth by encouraging companies to make more investments and hire more workers through drastic deregulation and tax incentives. Recent economic indicators have pointed to the weakening activities of Korea’s economy, including industrial output and exports. The country’s exports, which have shored up Asia’s fourth-largest economy amid sluggish domestic demand, recorded an on-year decrease in April for the first time in 18 months. According to data from the Bank of Korea, the consumer sentiment index has declined since November, marking the first time it has dropped for five consecutive months since the central bank began tracking it in July 2008. Most local private research institutes now expect the country’s economy to grow far below the government’s target of 3 percent this year. “There is a high possibility that the public will apply a stricter standard to economic performance when political reforms come to completion,” said Yang Seung-ham, a former professor of politics at Yonsei University.